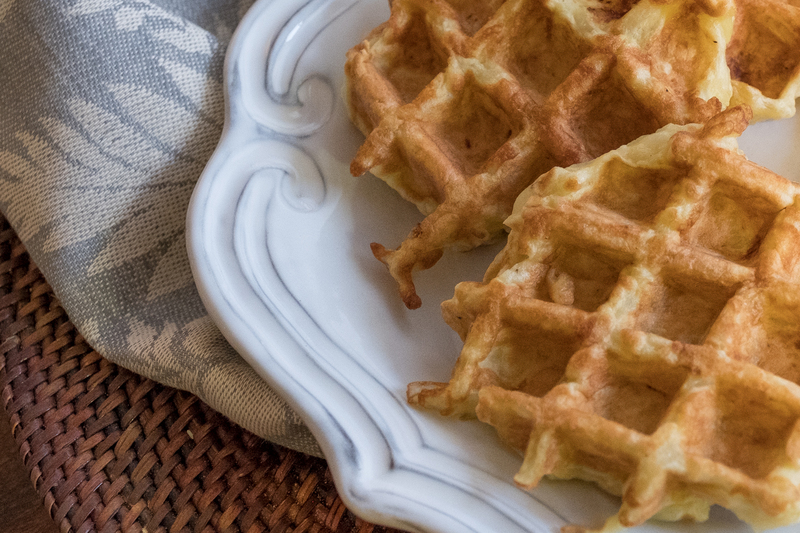 Put them in the waffle iron if you dare . . . nothing like latkes in any form. Really, any way you eat them, there’s nothing like a platter of potato pancakes to inspire excess. Plain and simple, the recipe I grew up with called for measurement in pounds: as many potatoes as you could stand to peel and grate by hand, as many onions chopped as needed to bring tears streaming to your eyes, eggs and matzo meal – enough to hold the ingredients together, salt and pepper – enough to taste, and if you really wanted to give your cholesterol a workout, a dollop of schmaltz – chicken fat – enough to add that indescribably heavenly Jewish flavor. 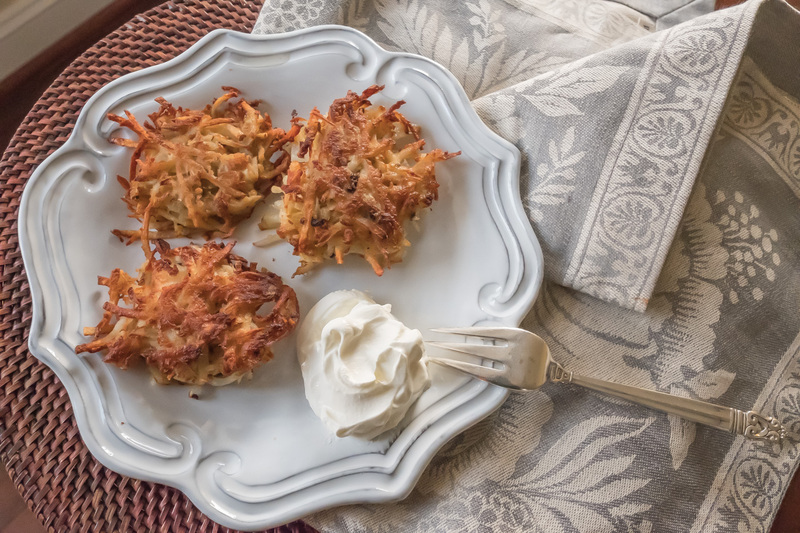 Latkes, the Yiddish word for the potato pancakes we know and love, are the iconic food of Chanukah, the Festival of Lights and Oil. Fried until golden in a pool of vegetable oil, drained on paper towels, latkes are best when eaten still sizzling, cooled just enough so as not to burn the tongue. Serve with sour cream and apple sauce (or homemade apple-cherry compote in tribute to Michigan tastes). 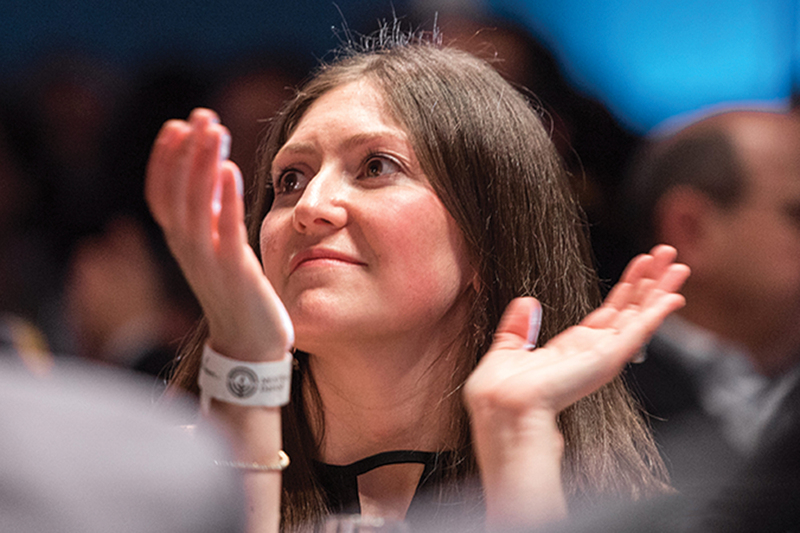 Make plenty – the more, the merrier. 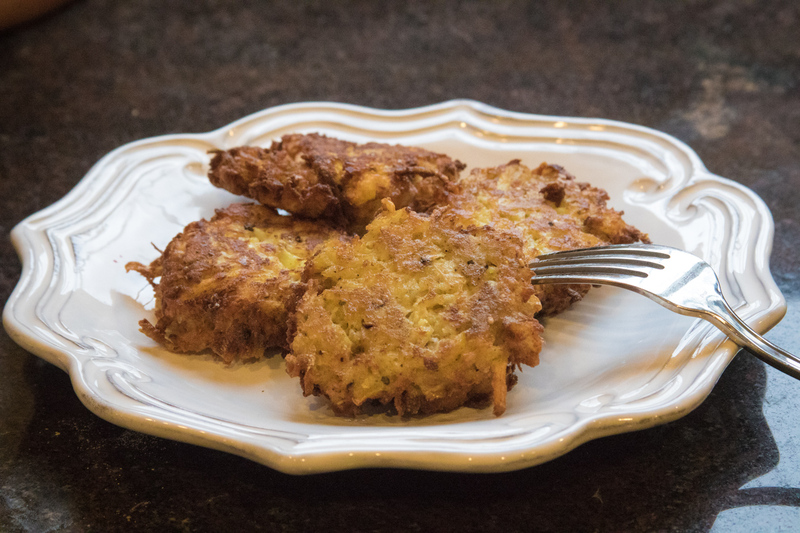 When it comes to latkes, ain’t no mountain high enough to slow down the descendants of the Maccabees. Essentially, making a great plate of latkes doesn’t take much practice – you grate, you mix, you fry, you eat. The basics: You grate, you mix, your fry, you eat. Bon appetit. For convenience, don’t bother peeling the potato. Through the blade of the grater, you will hardly notice the skins. 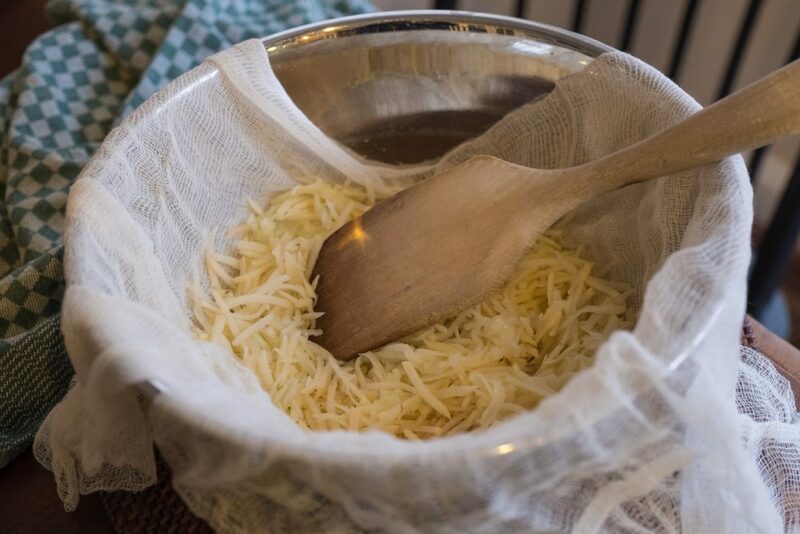 Drain as much of the liquid as possible from the potatoes using a colander or cheese cloth. The drier the mixture, the better result in frying. Use matzo meal or a combination of matzo meal and flour as a binder. Drain latkes on paper towels and serve immediately. You can also keep them warm in a low oven for an hour or more. In the fridge, they can keep for a day or two or in the freezer, separated and well wrapped, for up to two weeks. Reheat in a single layer on a cookie sheet in a 400 degree oven. 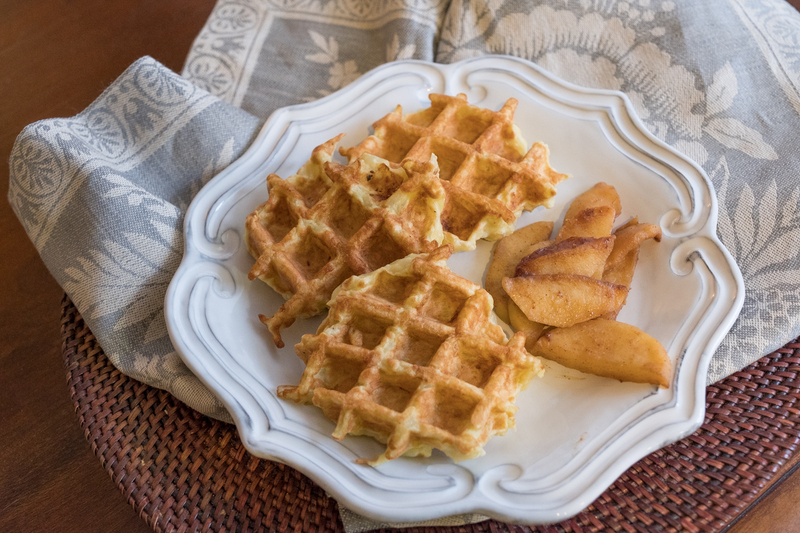 Latke waffles: A Chanukah spin on breakfast potatoes. Latkes are a do-ahead-er’s dream. You can also keep latkes warm in the oven for an hour or more, if you’re waiting for stragglers to arrive. Cooked, they keep well in the fridge for a day or two, or in the freezer, well wrapped, for up to two weeks. Reheat them in a single layer on a cookie sheet in a 400 degree oven until they’re crisp again. Bonus: If you undercooked them a bit or didn’t get the browning on them you’d hoped for, you can compensate for this in the oven. Peel the potatoes and coarsely grind the potatoes. Squeeze the grated potatoes in your hands and transfer to the bowl with the chopped onion. Heat half-deep oil in a heavy skillet over medium heat. Make pancakes and fry for 4-5 minutes on each side. It is important that the oil is not too hot. Serve immediately with sour cream or yogurt with some chives or parsley. The Latke Who Couldn’t Stop Screaming: A Christmas Storyby Lemony Snicket (Daniel Handler), published by McSweeney’s Books.